Antibody arrays allow researchers to conduct rapid, accurate expression profiling of hundreds of cytokines, chemokines, growth factors, proteases, soluble receptors and other proteins from any biological fluid. RayBio® Glass Slide-based Antibody Arrays (G-Series) were introduced as a “second generation” array platform after the chemiluminescent membrane arrays (C-Series). The G-Series uses a 75mm x 25mm glass chip platform which delivers easier handling along with the use of much lower sample volumes. The glass slides also utilize a fluorescent signal readout, allowing a wider dynamic detection range than can be achieved by chemiluminescence. G-Series Antibody Arrays are particularly well-suited for projects with very limited sample volumes (as little as 10 μl per array) and large numbers of samples. Dozens of arrays can be processed per day by a single technician. Furthermore, the slide chamber assembly is compatible with many automated array processing systems, allowing high-throughput studies to be performed with very little hands-on time. For a comparison & overview of all our antibody array systems, click here. Similar to the C-Series (membrane-based) arrays, G-Series Antibody Arrays utilize the sandwich-ELISA design principle. In this assay, capture antibodies are printed in multiple identical arrays on a standard-sized histology slide. After a blocking step, samples are incubated with the arrays. 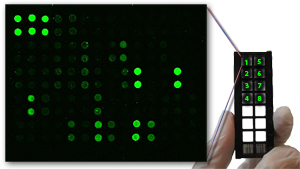 Nonspecific proteins are then washed off, and the arrays are incubated with a cocktail of biotinylated detection antibodies, followed by a streptavidin-conjugated fluor. Signals are visualized using a fluorescence laser scanner. For a list of laser scanner specifications, click here. More Data, Less Sample: G-Series Antibody arrays provide high-content screening using less sample volume than ELISA. Only 50 µl needed (after dilution) to detect up to 40 different biomarker proteins. As little as 10 µl original sample! Global View of Cytokine Expression: Antibody array screening improves the chances for discovering key factors, disease mechanisms or biomarkers related to cytokine signaling. Greater Sensitivity: As little as 4 pg/ml of MCP-1 can be detected using the G-Series array format. In contrast, our similar MCP-1 ELISA assay has a sensitivity of 40 pg/ml of MCP-1. Increased Range of Detection: ELISA assays typically detect a concentration range of 100- to 1000-fold, however, RayBiotech arrays can detect IL-2 at concentrations of 25 to 250,000 pg/ml, a range of 10,000-fold. Better Precision: As determined by densitometry, the inter-array Coefficient of Variation (CV) of spot signal intensities is 5-10%, comparing favorably with ELISA testing (CV = 10-15%).